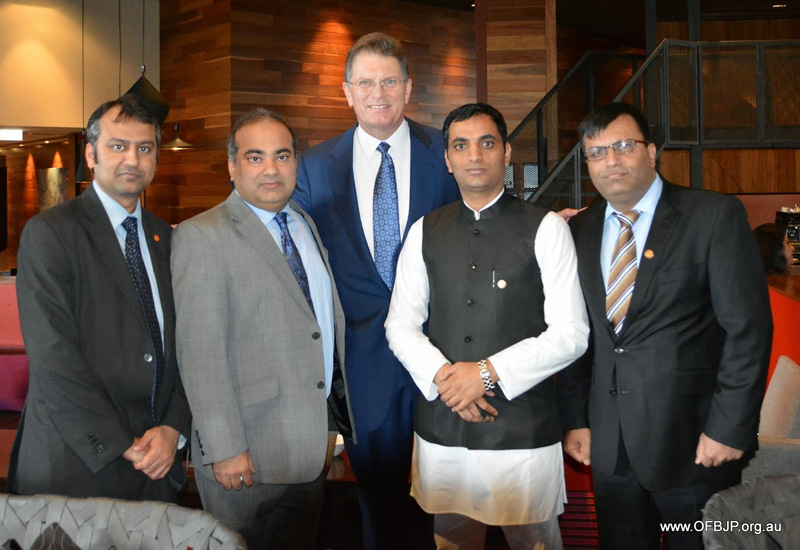 A renewed level of engagement for OFBJP Australia with the Australian – Indian community is need of the hour. 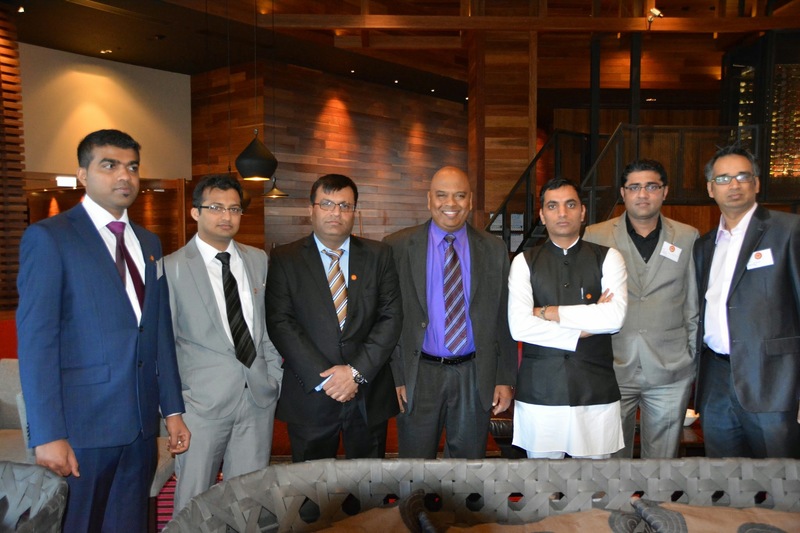 It is with this spirit, OFBJP Australia’s Victoria Chapter hosted ‘Meet and Greet’ in Melbourne. As the dust settles post elections in India; over a month of BJP Government in Centre; fresh chapter is being unfolded for OFBJP Australia. The attendees got opportunities to interact with key community and political leaders. OFBJP Australia President – Mr. Balesh Singh Dhankar and Convener Mr Rahul Jethi especially flew from Sydney to attend the event . Mr Singh explained the objectives of OFBJP Australia and the path the organisation has set out to walk. The occasion was graced by Former Victorian Premier Hon. Ted Baillieu, and Shadow Parliamentary Secretary for Multicultural Affairs Mr Jude Perera. India’s Prime Minister Shri Narendra Modi, after winning election had articulated that his government was committed to sought and provide co-operation with every stakeholder. True to this spirit and in line with the idea of Australia’s’ multiculturalism, OFBJP Australia facilitated participation of indigenous Australians and representatives of diverse nationalities including – Sri Lanka, Pakistan, Pakistani, Afghanistan, Nepal, Bhutan, Bangladesh, Fiji, Mauritius and South Africa. Mr. Singh addressed the assemblage and his key points included the emphasis of Indo-Australian trade relationship. He explained that while OFBJP Australia earnestly and tirelessly worked for campaigning for BJP in the run up for the elections, the real work for the organisation starts now. Mr Baillieu, congratulated BJP on its resounding electoral victory and formation of government. He emphasised on the significance of electoral majority in government’s ability to take bold steps towards undertaking reforms. In addition to that he expressed his views on the vitality of trade relations with India especially under the current leader of Shri Narendra Modi. He shared his own experiences of leading a trade delegation to India in the past. Moreover, he recognized the significance of OFBJP Australia’s involvement in campaigning for the party in the concluding Indian elections. Mr. Baillieu touched upon socially sensitive issue for Indians – dowry. He explained the rationale behind the recent petition in Victoria in favour of banning the dowry by defining dowry as an economic offence. He emphasized this problem was not limited to any particular community or religion but in fact was a malaise spread across several communities. At the event, Mr Jude Perera said he looked forward to OF BJP Australia playing a constructive role in bringing India and Australia closer. Many OFBJP delegates had flown in from various cities to attend their first formal networking event. Dr Anjali Tikoo, Women Cell Coordinator, OFBJP Australia’s Victorian Chapter, gave a brief overview on how OFBJP plans to work with local Indian community associations, and other women’s groups towards the welfare of Indian women in Australia. Ms. Priyanka Sharma, Fiji Indian Chapter Coordinator, OFBJP Australia’s Victorian Chapter, spoke on how OFBJP Australia plans to engage with the local Fiji Indian community. By inviting leaders from both the major parties in Victoria to their first formal event after formation of the government in India, OFBJP Australia has sent out signals that they will be engaging with both the major parties when it comes to dealing with local or international issues. Various community leaders and prominent stakeholders in the India–Australia relationship attended the networking function. Among them were Farrukh Hussain (founder and patron – South Asian Community Link Group), Mrs Kaushalya Vaghela (Little India trader), Bhakta Das (ISKCON Temple, Albert Park), Mr Arwinder Singh (Gurudwara Sahib, Tarneit), Viv Prasad (ACHRH), Ms Noreen Toohey (Coordinating Magistrate – Sunshine), Rakesh Raizada (RaMon), and Gurpal Singh (AIBC & Saundh, Singh and Smith Lawyers ILP). Such an enthusiastic representation and mingling of diverse nationalities, cultures and background was exactly the kind of event any pluralistic society would be proud to be part of.